Wondering how to make Skype push to talk? Well if the answer is yes then we are here to help you out. As you already know that Skype is the most used video chatting platform, it even exists in the world for a quite long time. Skype was one of the first services when it came to video chatting since then to know it has a user base of 75 million active users. However, in recent times, there are quite a lot of other apps that let you do a video call. But Skype still remains the number one. 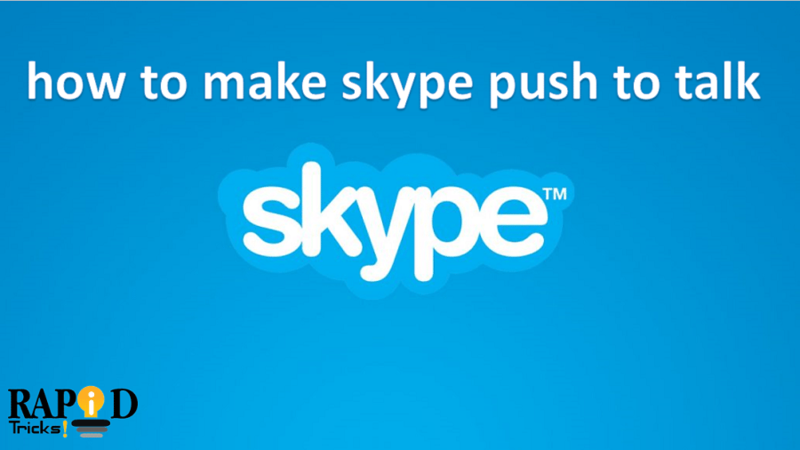 Now coming back to the question, I will tell you the complete process on How to enable push to talk on skype. In order to make Skype push to talk here are all the steps that you need to follow. So here we go. First of all, make sure you have the Classic version of Skype. As the latest skype version does not comes with the feature. If you already don’t have Skype on your PC then download and install it by following the simple steps given below. So First of all, you will need to download the Skype version, you can check out software downloading sites like Filehippo and Softonic. Or you can visit download it from here. Download the software and install it by double-clicking on the file. Once the installation process gets started, you have to follow the screen instructions. The screen instructions are easy and you just have to click on the next button a few times. Also, you have to accept the license agreement and you are good to go. Once the Skype’s classic version got installed, then you have to restart your computer. Well restarting your computer is not a recommended option, but most of the people prefer a restart after every installation. So if you want to do a restart then you can else move onto the next step. Follow these steps to know how to enable push to talk on skype, if you already have Skype on your device. Once you complete the installation of Skype then follow the steps given below, If you already have Skype then you can skip the above points. Now in order to make Skype push to talk. You have to click on the tools from the navigation menu from the top bar. Then you have to go to the Options page, so click on options. Once you are on the options page, now you have to look for the Advanced option and click on it. From the Options menu, you have to go to the Hotkeys menu. So click on the hotkeys menu. Now a page will open with lots of options. From here you have to look for the Toggle Mute(Push To Talk) option. The option is placed at the bottom of the menu bar. So check the Toggle Mute(Push To Talk) option. After checking the box you have to look for the Change Select Shortcuts option. The option is placed at the bottom of the screen. Once you have found the option place a checkmark on it. So that was all for your question that says how to make Skype push to talk. Also, it is advisable not to change the settings if you do not have any idea. As wrong settings may cause you some issues. So this is how you can easily enable push to talk on skype, if you follow the above-given steps properly then you can easily Make push to talk on skype. I hope this article on how to make Skype push to talk helps you solving your query. If you have any further questions do let me know in the comments section. I’d be more than happy to answer your query.